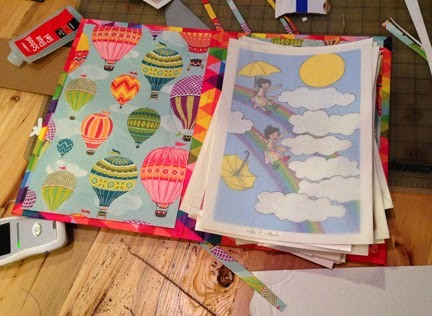 The art for the fourth Ling and Ting book is finished (have you read the third one? hope you liked it)! the board in now empty, as compared to before! Before Rain Dragon made her appearance, I used to make a special art folder every time I began a book. I love pretty paper and it was an excuse to buy and use it; but it also became kind of a ritual--a way to focus before starting work. I haven't made an art folder for a couple of years now because I just didn't have the time. But with the art for this Ling and Ting book finished, my plate is finally cleared to plunge into the novel completely without any other work distractions. And I am a little nervous! the outside is rainbow colors! the inside is rainbow balloons!